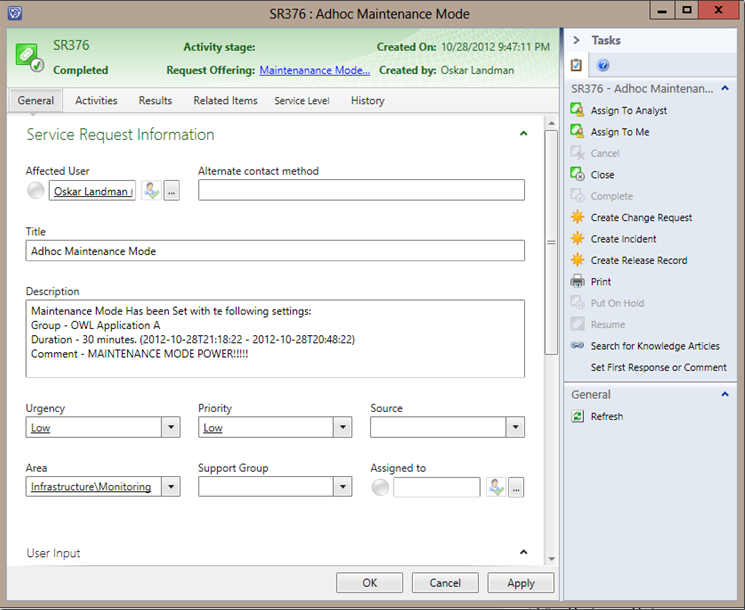 This posting is about using the Self Service Portal to set OpsMgr objects in maintenance mode. 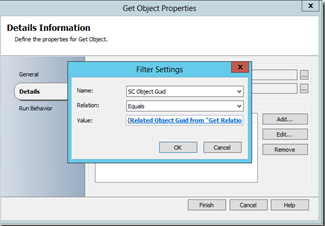 This simple example shows how you can use the System Center 2012 Extended OIP in combination with SCSM and OpsMgr. The runbook can be used to make adhoc maintenance mode available to application owners. The first thing which you need to configure is a runbook in Orchestrator. Start a new runbook and name the runbook AdHoc Maintenance. These are the properties we are going to add to the runbook from SCSM. 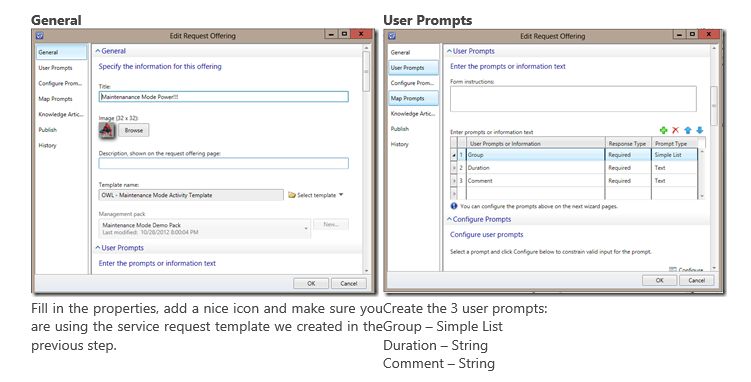 Because we are going to use a simple list in SCSM we need to query OpsMgr for the group Internal Name. 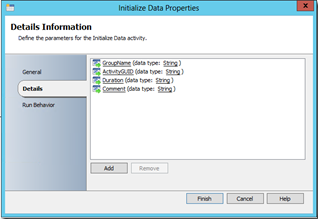 We can do this by using a filter on DisplayName which matches the input from SCSM. 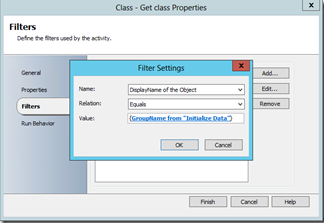 Internal Name from previous Class – Get Class Activity and both comment and duration from SCSM. 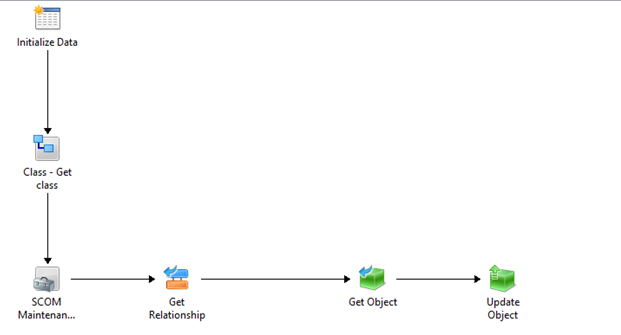 This will query SCSM for the runbook activity related class service request. This will get the Actual Service Request by using the GUID we retrieved from the previous step. This will add the description with the results of the Maintenance mode into the service request. 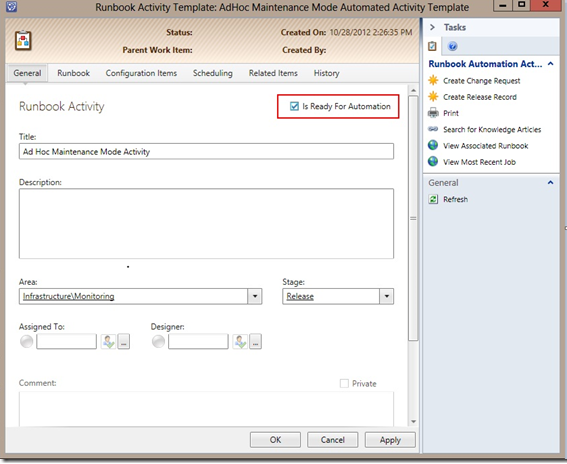 Fill in the require properties and don’t forget the IS READY FOR AUTOMATION checkbox! Set the ActivityGuid to the Object ID you will need this to be bale to update the Service request Description in the Runbook! Leave all other parameters empty. 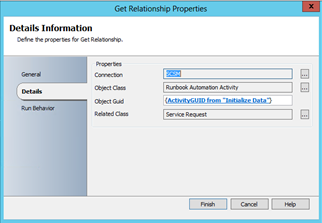 Next you will need to create the Service Request Template to include the Runbook Activity. Fill in the default request properties. Add the Runbook Activity we created earlier. 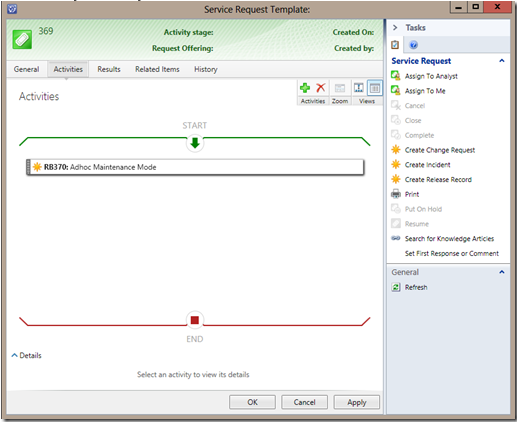 No need to change any settings just add and click on OK to create the service request template. 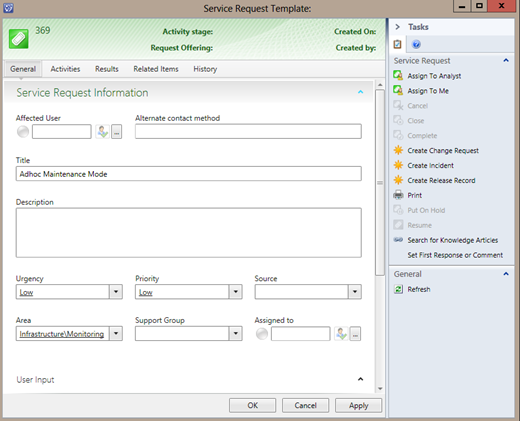 After creating the service request template you can now create the request offering. After setting these settings you can publish the request offering. The last step is to create a service offering and add the request offering to the service request and publish the content on the self service portal. The request offering on the SSP. 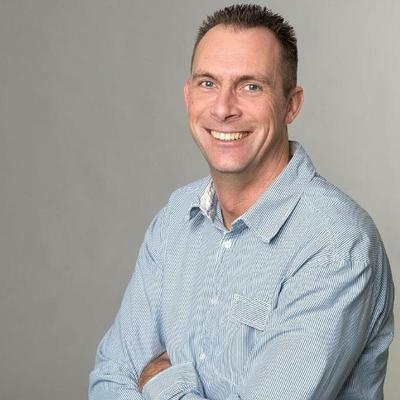 Here is one simple example on how to really benefit from the System Center 2012 Extended OIP and make Maintenance Mode available to Application owners since they are the people responsible for the application or services! Real easy to set maintenance mode and log everything directly in SCSM user who raised maintenance mode and when everything nicely logged at the place where it should be logged! You can setup scoping on the Self Service portal this way to make these kind of tasks only available to a delegated group of users. You can add other activities as well to deliver full self service and the best part about it everything is logged in SCSM and no extra privileges required on the systems everything being taken care of by Orchestrator! 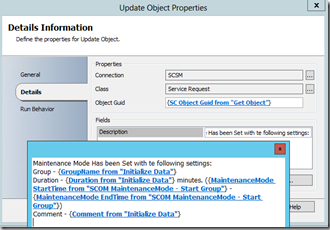 You can add scheduled runbooks in orchestrator itself for the scheduled maintenance tasks this extra SCSM request offering is just for when they want to place objects in maintenance NOW! As a side note my main goal was to sync all groups from SCOM to SCSM which worked like a charm with the sync properties in the OIP! BUT there is one really nasty thing when setting up the user prompts to query based. I had no way to filter the query on groups!!!! Which made this kind of useless and needed me to step away to a simple list. Although I am assuming this is restricted because the UI for Query based is filtered and doesn’t make it possible to filter based on groups I will try if XML only works. 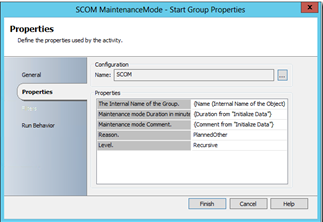 Because the end result when you select a group which lives in SCSM makes the solution more dynamic and less error sensitive you could add the group as affected item to the service request. Will try a Exchange or Sharepoint Calendar solution where application owners can add schedules by using the Self Service Portal and using an orchestrator runbook to pull the schedule and set maintenance mode automated. This will really deliver scheduling and setting maintenance mode to the application owners / administrator leaving the OpsMgr admin to do nice things instead of scheduling maintenance for everything.